Laptop bags that protect your computer during transport are usually all function and no form. And rightfully so. But this 15-inch Lifewit bag is actually incredibly attractive and functional, with durable genuine leather, a padded interior, and five pockets for things like your phone, chargers, and more. Use the code 3RGMI8QN and pick it up for $49. There are lots of aluminum laptop stands out there, but this is the only one I’ve seen that can fold completely flat to fit in a backpack, and prop up your laptop at two different angles. Plus, at $22 (with code VX2CXZFX), its also cheaper than most alternatives. Win-win. While mesh routers have broken through in 2016, the Wirecutter-recommended TP-Link Archer C7 is one of the best “traditional” routers you can get, and it’ll only cost you $72 today with promo code 15TPLC7. It was down to $70 around Black Friday, but this is the best deal we’ve seen since the holidays. We all know that Anker’s PowerCores are far and away our readers’ favorite USB battery packs. But the 10400 model in particular, at least in my opinion, is the best choice for most people. It holds at least two full phone charges, includes two ports for sharing, and is small enough to fit in just about any pocket. Unless you’re going off the grid for multiple days at a time, that’s right in the Goldilocks zone for most people. 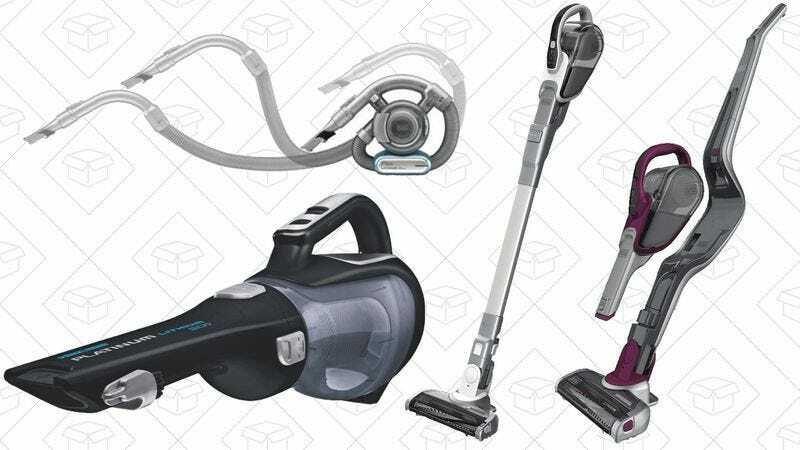 The cheapest option here is a hand vac that’s great for cars and tight spaces around the house, but all of the full-sized vacuums in the deal can shed some extensions and become hand vacs themselves, so that’s the route I’d go. The 16V 2-in-1 seems like a particularly good bet at $90, or roughly $25-$75 less than usual. Just remember that like all Gold Box deals, these prices are only available today, so pick yours out before they’re all sucked up. Packing cubes can make organizing clothes and toiletries for your next trip a little less hellish, and this highly rated set of four is only $16 today, complete with a bonus dirty laundry bag. This stick-anywhere LED light seems pretty basic—it doesn’t have a motion sensor or rechargeable battery—but for $5, it’s pretty impressive that you can customize the brightness level and turn it on by tapping almost anywhere on the body. If you have any closets or cabinets without sufficient light, I can think of worse solutions. Magnetic smartphone vent mounts are the sleekest and easiest way to prop up your phone in the car, and you can get two mounts from Aukey for $9 today with code AUKPACK2. Even if you already have one in your own car (a pretty safe bet! ), it’s worth tossing an extra into your luggage to use in rental cars whenever you travel. Amazon’s back at it again with the sample box deals, and this time, $10 gets you six sample-sized men’s grooming items, plus a $10 credit towards dozens of full-sized items from this list. Assuming you use the credit, that’s like getting all of the samples for free. Kubo And The Two Strings has everything a perfect family movie could need: beautiful animation, anthropomorphic animals, and a feisty, young main character that has to save the day. And for $10, it’s something that should be on your Blu-ray shelf.